A few days ago, Huawei announced its short term goal: overtaking its main rival, Apple, in the next two years. In the long term, it obviously wants to take first place on the manufacturer’s podium, which is currently being occupied by Samsung. I believe it is perfectly capable of achieving this goal. Read on to find out why. Is Huawei just overly ambitious? That's a matter of perspective. When you're sure of yourself, it's not ambition talking, but self-confidence. It is only in case of failure when we are able to see whether self-confidence was deserved or exaggerated. We will find out in the next few months if Huawei is biting off more than it can chew with these big goals, or if it is merely keenly aware of its own potential in the market. There are several things which have led me to think that Huawei’s self-confidence is not exaggerated and that it is capable of achieving their goals. You may not know that Huawei is the leading Chinese manufacturer and ranks third in the international scene. In other words, it is a giant, and contrary to what skeptics are saying, it knows how to manage several markets. Case in point: nearly half of its sales are outside China's borders, with a good portion of these being in Europe. The influence of the Chinese market is strong but it's not the core of Huawei’s strategy. Apple often attracts a lot of criticism but if there is one thing that cannot be taken away, it is the success of its production system. Designed with vertical integration in mind, phone parts are manufactured by suppliers that are gathered under the Apple’s banner. This model has been proven effective by other manufacturers as well, as Samsung uses a similar model when producing its own Exynos processors, and Google opts for a similar strategy with the Pixel. Huawei is also moving in this direction, manufacturing its own processor, Kirin, via its subsidiary, HiSilicon. What is the point of this strategy? By obtaining the hardware components from its own subsidiaries or partners, companies can avoid having to buy from third party suppliers, who act as middle men, marking up the price to make money themselves. Of course, some manufacturers still have to go through others to get certain technologies. For example, Apple has purchased processors via partners before. In these cases, it will try to minimize the costs as much as possible. With this strategy, Huawei is giving itself a chance to maximize its profit, which increases its attractiveness to investors, which will ideally translate into more innovative, high quality products, thus ensuring further sales and continuing the cycle of success. The problem Huawei faces in the West is its brand. It is not yet as popular as Apple or Samsung as a smartphone manufacturer, and it suffers from the bad image which often accompanies Chinese manufacturers. It will cost a lot to change that, and so a part of the company's budget has been set aside to address this on a large scale. For example, it has invited not only tech journalists but also mainstream newspapers to their conferences to ensure it has the widest audience possible for their products. And, yes, that marketing budget is bearing fruit. Just a few years ago, Huawei's booths and stands in major conferences like MWC were not particularly big or impressive. Things have changed. The budget given to it today allows it to have bigger, flashier stands and attract more people...but that isn't the reason people are attracted, it is merely a byproduct of their success thus far. Huawei’s increasing success in Europe building momentum, attracting more and more customers, from journalists and technology specialists to everyday people who see the value and quality of their products. In just a little over a year, Huawei has seen a 63% increase in the sales of its smartphones worldwide. In China alone, it was 81%. Last summer, impressive figures for the beginning of the year were announced: a 40% increase in sales. In other words, demand is becoming even stronger. Huawei is meeting the popular demand by increasing production. Generally, Chinese manufacturers suffer from a bad reputation: poor hardware quality, spyware, and other undesirable characteristics. While some less well known manufacturers, as well as some retailers, can be problematic, Huawei is definitely not among the worst of them. As we have seen recently with both Samsung and Apple, manufacturing problems can happen to any manufacturer, even the most reputable. Having said that, the reputation of Chinese smartphones is improving nonetheless. Customer interest in Chinese manufacturers (thanks to prices being generally cheaper than the competition) and manufacturer interest for the European market have prompted companies like Huawei to make more of an effort. In terms of quality, the idea that Samsung or Apple is better than the others might soon be a thing of the past. 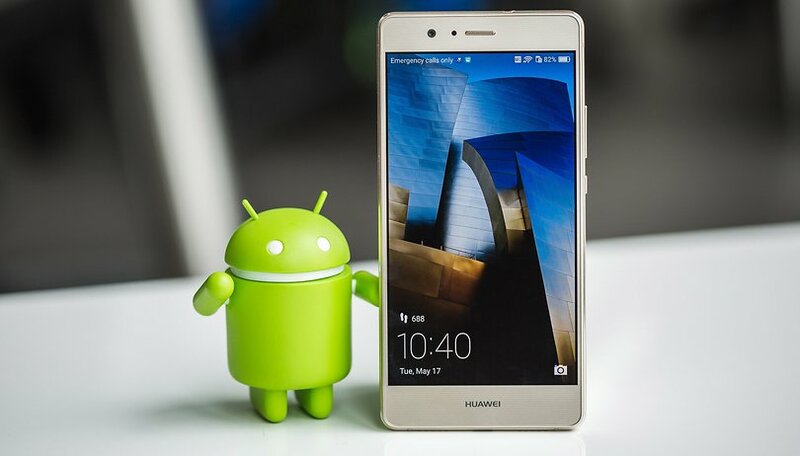 Number three, Huawei, is being presented as a viable alternative to the top two nowadays. The software interface for Huawei, EMUI, is often criticized. On the one hand, it is reproached for being an Android based system modified to look like iOS (possibly under the influence of the Chinese public). On the other hand, updates take a long time before being deployed on these devices. Obviously, this second point relates to the first. Having said that, we were able to see that things have changed with the release of the Mate 9. I am saying that EMUI is getting closer to stock Android. As my colleague Pierre said, “Huawei has made great progress when it comes to the software interface.” Seasoned Android users will be less confused. Regarding updates, my colleague Eric had an interview with the brand’s Vice President, who confirmed that future updates will indeed be faster. What more could we ask for? Huawei has a keen understanding of its market position and strategy. While it have a long way left to go before overtaking Samsung and Apple, it does in fact have a lot going for it. What do you think? Will the manufacturer's momentum lead it to the top? Huawei is a very smart company. They still have a ways to go but considering their momentum it will not be long. I do not think they will ever over take Apple but they certainly could remove Samsung from number 2. Samsung is not Android and the sooner more of these OEMs realize that putting on heavy UI layers over Android to offer redundant apps and more value than other brands only makes people hate the brand. We also know when you include apps you are getting paid to do so. Asus zenui is the worst. Huawei emui is bad but it could be a lot worse and at least it is stable. I have a OnePlus 3t and I bought it when the Mate 9 came out. The Mate 9 is really close but the $600 price tag was too high. The Kirin 960 looks to be an amazing SOC and emui 5 is supposed to be much better but almost a $200 price difference when tax is considered is hard to justify. If they get fast regular updates even to older devices, make the emui interface even less obtrusive, lower prices a bit, keep giving good hardware, improve their screens with better scratch resistance and better resolution and they will certainly blow away the competition. I have a Nexus 6p and in low light the camera is better than the Sony digital I have. It has the Gorilla glass that has never broken, a couple tiny dots from being dropped but I've seen lots of cracked iPhone screens. I will stick with a Google phone because with Google Project Fi I only pay $20 a month for unlimited talk and text and almost 100% of my data use is on wifi so my phone bill is $25 a month or less, you can't do that with other services. I don't care if its made in China so long as it works. I owned 3 huawei's in the past few years, there so great. I've also had an iPhone 4, 4S and 5. And not to forget a Samsung Galaxy II. I currently own a Archos Diamond Plus. From all these phones, I think huawei was the best, I usually replaced there system with CyanogenMod, but the phones are great. And yes I think that Huawei can beat Apple and Samsung. And just because Huawei is an chinese company doesn't mean they have spyware or are very bad. i owned HTC, Samsung, LG, Sony etc and also Nexus devices. Currently a Honor 7 (basically a Huawei) and it's by far the best device i owned in hardware. The software needs some getting used to, but it's so much better and smoother than any Touchwiz or LG UI. In total it's a fantastic device and i'm interested in the new Huawei Mate 9 because it's already available after a few days after announcement here in Europe. If you value your personal information, don't do it. I own a Nexus 6P (Huawei) because Google controls the software. It was announced last week that several Chinese manufacturers had spyware on their phones. I wouldn't have bought the 6P but it says Google on it. Well i would completely disagree with that. Huawei is in no way comparable to companies like Blu. We have multiple people in the office using Huawei devices and the software is really comparable to any other manufacturer. Did they say Huawei was implicated? Did you do any fact checking? Did the the article blame Obama? Did you click on the skating monkey? It's never going to happen because the majority of Android users prefer Samsung hardware. As were saying all the Nokia / Symbian fans only a few years ago about Android when nearly half the phones sold were Nokias! They gave been guilty of providing user information to the Chinese government. There is no way I will ever purchase one of their phones. Are you not using social media? Why would you want to buy a Chinese phone! Yes it's got all the bell's and whistles but as with all Chinese products it ain't reliable. Remind me again, where are Apple phones made? Bottom line Samsung is android nobody else compares or comes close period. Samsung has owned the Android platform #1 since March 2011 Huawei will always be secondary or third at best. I never look at the name of a smartphone, because usually I am interested in the specs which that item is offering. At the moment I am owning a LG phone because when I bought it this was the phone to meet for me the best price-value ratio. Right now I am looking for a new phone and I take in count every brand and manufacturer because the more you see the better your knowledge will be. So weather a small chinese or a giant american it is worth a try cause you never know, you might find the perfect phone for yourself like this and be finally free of a brands "chains". I've personally been keeping an eye on Huawei, and slowly but surely their market share and quality has grown by leaps and bounds. Apple and Samsung and even Google should be worried.